Red-cooked pork is a Chinese recipe where pork belly is braised in spiced soy sauce for hours. Easy red-cooked pork recipe that is tasty and authentic. Red-cooked Pork Belly – Chinese recipe where pork belly is braised in spiced soy sauce for hours. Easy red-cooked pork recipe that is tasty and authentic. Shanti is a good friend of mine, we met each other through her husband Peikwen Cheng—my ex-colleague and the most talented photographer I know. Based in Beijing, Shanti travels all over China meeting with local families to learn about authentic home-style Chinese cooking. Her many journeys are documented on ShowShanti. If you’re a fan of local culture and story-telling, you have to check out ShowShanti. She is also the proud designer of her gorgeous and colorful Chinese aprons, which you can enter to win. Don’t miss this scrumptious red-cooked pork belly recipe, which she learned from real Chinese home cooks in China, and remember to start following her adventures on ShowShanti.com. When I first came to China, I didn’t know about Chinese food any more than what I had eaten at countless Chinese restaurants in California. Typical dishes my family and I would order included egg flower soup 蛋花湯, barbecued-pork steamed buns 叉燒包, spareribs in black bean sauce, barbecued pork, roast pork, Cantonese roast duck, glutinous rice stuffed with pork and steamed in lotus leaves 糯米雞, Ma Po tofu, and pork fried rice. Those dishes were a great beginning for my American Chinese food repertoire. Upon living in China, I encountered many more dishes; too many to list and yet so many more to try. The dish that quickly made an impression on me was hóngshāo ròu (红烧肉, red-cooked pork belly)—cubed cuts of pork belly braised in soy sauce and fragrant spices with fat that tenders the lean and falls apart in the mouth. The savory-sweet combination seduces the taste buds, rendering me addicted to this dish for life. I learned a version from one Shanghai family (Chen Chen’s hóngshāo ròu recipe) that had neither chili nor spice; I felt something was missing. I’d learned hóngshāo yu (red-cooked fish), hóngshāo shanyu (red-cooked eel), hóngshāo tuji (red-cooked organic chicken), and hóngshāo zhuti (red-cooked pig’s feet); all of which included fragrant spices like star anise, chilies, Sichuan peppercorn, cassia bark, and black cardamom. I prefer hóngshāo ròu with chilies, Sichuan peppercorn, star anise, and cassia bark. Hóngshāo ròu is a simple dish and deserves every spice and minute you can give to its perfection. After making different variations of hóngshāo ròu, I have decided upon a medley of flavors that makes my own family claim this recipe a favorite. As with all home-style recipes, you learn someone’s original recipe then you make it your own. Stick to my recipe a few times then stray with the muse of your own taste buds. Serve hóngshāo ròu with rice and Chinese broccoli. Parboil — Bring a pot of water to boil. Immerse entire slab of pork belly with ginger. Remove any scum that surfaces. After five minutes, discard water and rinse meat and ginger with cold water. 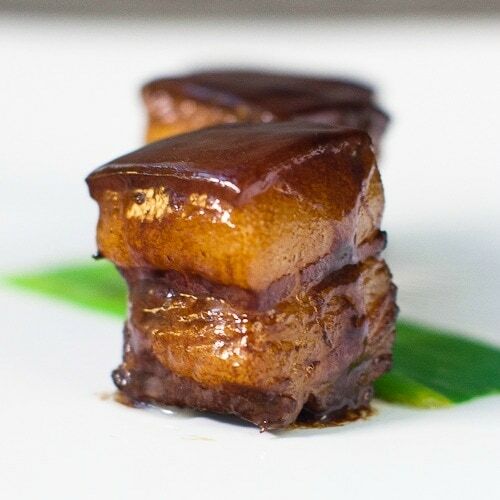 Slice pork belly into 1-inch cubes. Braise — Heat cooking oil and sugar in a clay pot over low flame and let the sugar begin to melt. Toss in the pork pieces and ginger with scallion, chili peppers, Sichuan peppercorns and brown over high flame. Add Shaoxing wine and dark soy sauce while continuing to stir fry. Add salt, star anise, cassia bark and water. Bring to a gentle boil then simmer over lowest flame, covered for at least 2 hours. Stir occasionally. Serves 6-8 people with a dinner serving 6-8 dishes. To convert the measurement, please check out the Conversion tool. OMG, mean pieces of red-cooked pork belly. I like! Make me hungry…..love it when I was in Singapore. This looks like the kind of Chinese food I really love, the more typical, the better. I never had this when I was in China, I think I should try out your recipe, xiexie. You’re missing out! The skin and fat are the best part of this dish – that’s where all the flavor is! Once in a while won’t kill you! Yes, once in a while keeps it a savoured treat. When choosing your piece of pork belly, you can select the pork-to-fat/skin ratio you prefer. There are some with less fat or more meat than others. Typically, you want to choose a piece of pork belly with as even a strata of meat/fat throughout the piece as possible. It’s like eating bacon; I eat the fat and lean in every rash of bacon. While people used to live on eggs, bacon, real non genetically modified meat and vegetables, nobody was seek. Please for Your own sake, do not listen everything that big producers tells you to. And for once, try to enjoy in what You eat! I would kill my self first If I will only see percentage in every food I eat :) Shanti, good work! YUM!!!! This looks so delicious! I love these flavours, my hubby always wants me to make Char Sui but I bet this is his next favourite dish. I also love Char Siu! This dish is certain to be a hit with your husband, if he loves Char Siu. I can’t say there is a substitute for the flavor of Sichuan peppercorns, but you can leave it out and the dish will still be very delicious. Sichuan peppercorns possess a citrusy, numbing sensation which the dish can have or do without. Isn’t this dish, without the spices, the same as Dong Po Rou, from the Shanghai area? They’re both really great dishes, but having lived in Sichuan for a year, I’ll take any opportunity (as these cooking traditions allow) to throw in chilis and hua jiao (pepper corns)! Dong Po Rou is very similar, but softer like pudding. I LOVE Dong Po Rou, too! Some other things you can add per your preference: deep fried tofu (炸豆腐), cubes of daikon, and/or dried shiitakes. These soak up the flavor and add another dimension to the dish. Ummm…this is so bomb! I love it! This is sinfully delicious looking! Hi, can u let me know what can be used to replace peanut oil? Can I use normal cooking or olive oil or even sesame oil to replace? BUt whats is the green stuff at the bottom? leaf>? sauce>? Made this on the weekend – sooo yummy! The addition of Sichuan spices is a significant improvement over the more traditional Shanghai version of this dish. I think this may be the most delicious thing in the universe. It’s just another variation. bay leaves,Black Cardamom, Cinnamon, dried chilies, Chilli Bean paste are actually not typical for this dish. But the combination of the ingredients sounds wonderful. Meanwhile the recipe author clearly states…. Sigh, there’s one in every thread it seems. Have you tried this while gently smoking the pork as prior to braising? I have had Dong Po and Hong Shao before, and I think it might work but was wondering if anyone has tried that approach. Can substitute Sichuan peppercorn with white peppercorn? Yes but don’t taste the same. Omg, don’t forget you can also add white turnip and eggs to the mix while braising too. So much yum!! I have made this dish several times and love the taste and really like the fat layers – I’m not one of those people who shuns fat. I eat quite a lot of it in fact. But the meat layer is dry and on the tough side. I have cooked it on very low, slow heat in a heavy bottom pot for a long time. I have cooked it in a pressure cooker – again low heat. I have tried slab cuts, and thick rasher cuts (like very thick bacon). Same result every time. Is the last bottom (furthest from the skin) thick meat strata supposed to be on the dry side? Please help. The succulent meat made me wanted to try out. But there are so many methods which I dont know which one to follow. I followed the recipe here. It is a seller. My boy had 2 bowls of rice with it. I did not have the time to braise so moved the meat to pressure cooker for 20min on high. Thanks.